Best suited for two adults and two small children.This one bedroom cabin offers a king size Tempurpedic mattress in the bedroom and queen sofa in the living area. Just outside your window you will find a peaceful picnic area and a fire pit. Hot tub for two on screened porch, fiber-optic fireplace, full-size kitchen includes stove, refrigerator and microwave as well as cooking utensils. Cable flat screen TV, WiFi and heating/air conditioning provided. This cabin is perfect for the 'outdoorsy' type! 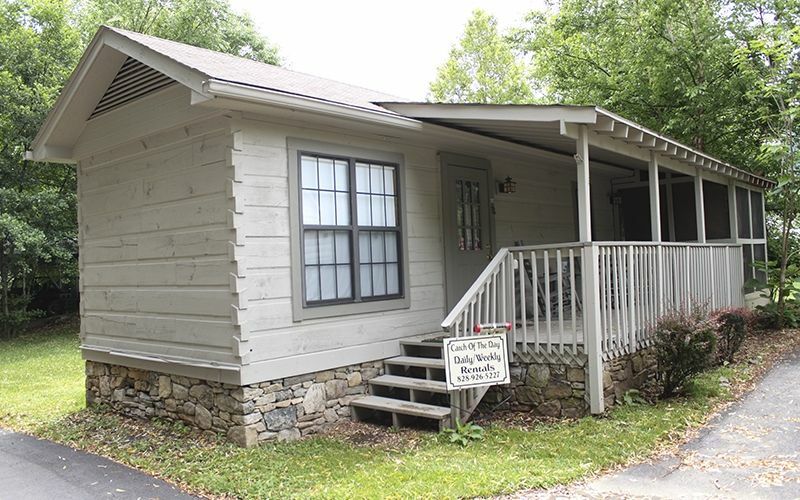 Located in the heart of Maggie Valley on Soco Road, near all the major restaurants and attractions. Great!! Have no complaints. Very relaxing and peaceful. Perfect for a weekend getaway! My fiancé and I had a perfect valentines weekend. Perfect location in between Asheville and Gatlinburg. Definitely would stay again! It wasn't what we were expecting, but Carolina and her husband are extremely nice and attentive. Perfect for a couple. Everything we needed was provided in the very clean cabin. The bed is amazing. The only negative thing I can say is there was way too much chlorine in the hot tub. We will definitely be back! The cabin was clean and comfortable. Right in the heart of Maggie Valley, but on a private road with private parking, and quiet. The bed was comfortable, and the hot tub was wonderful! Truly enjoyed our stay, and will be back! The cabin itself was very cute and well kept however there is a reason why no pictures are provided of the view from the cabin. Don't drive anything large because you only have a tiny parking space that separates you from the next cabin. Small pets (12 pounds and under) are only considered. Please do not reserve this cabin if you have a dog larger than 12 pounds. You will be ask to vacate the property and there will be no refund.